This weekend, I traveled to North Carolina for a friend's wedding. Once Mike and I crossed the NC border, we decided to stop at Smithfield's Chicken & BBQ, which was really just one step above KFC. However, the people were beyond friendly; you don't get to see that in Tampa. Also, TRIVIA!, in North Carolina, there is apparently only one type of BBQ and that is pork. Mike asked, "What type of BBQ is it?" (translation: what meat?) and the response was, "Just...BBQ", as if there couldn't possibly be another option. It was true. The BBQ only applied to the pork. 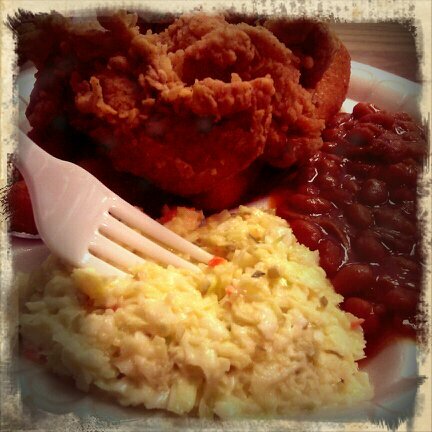 I decided to go with the chicken tenders, baked beans, and coleslaw. Overall, we spent 11 hours in the car on Friday, driving from Tampa to Raleigh, and were exhausted. But, the bride was out in Chapel Hill, celebrating after her rehearsal dinner. So, we headed to dinner at Tasu Asian Sushi Bistro & Bar (where we had an amazing wonton soup, General Tao's chicken, jasmine rice, and chicken with broccoli) and then down to the Carolina Brewery for a yummy beer. I opted for the Copperline Amber Ale, a red ale brewed with caramel and pale malts. We relaxed, had good conversation, and enjoyed each other's company. The atmosphere is great and they sell these growlers to take home! After, there didn't seem any other option than to go across the street to Time-Out Restaurant, a restaurant visited by Adam Richman of Man vs. Food. Famous for their Chicken Cheddar Biscuit, Time-Out also had other delicious options. I ordered the mac & cheese and the green beans and was very pleased with both. Stay tuned for my food recaps through the rest of the weekend! 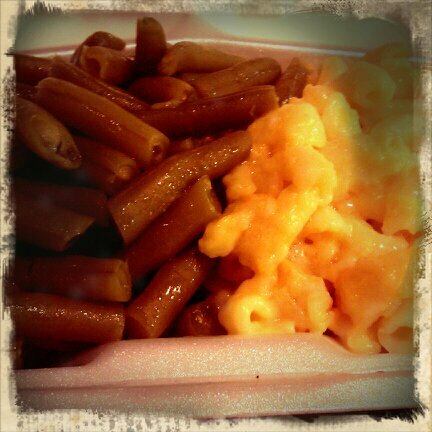 Mmm, green beans and mac and cheese. Forget the BBQ, I'll take those. That's so insane! BBQ is just pork. No way, Jose! now I'm hungry. that looks so good! allll of it.